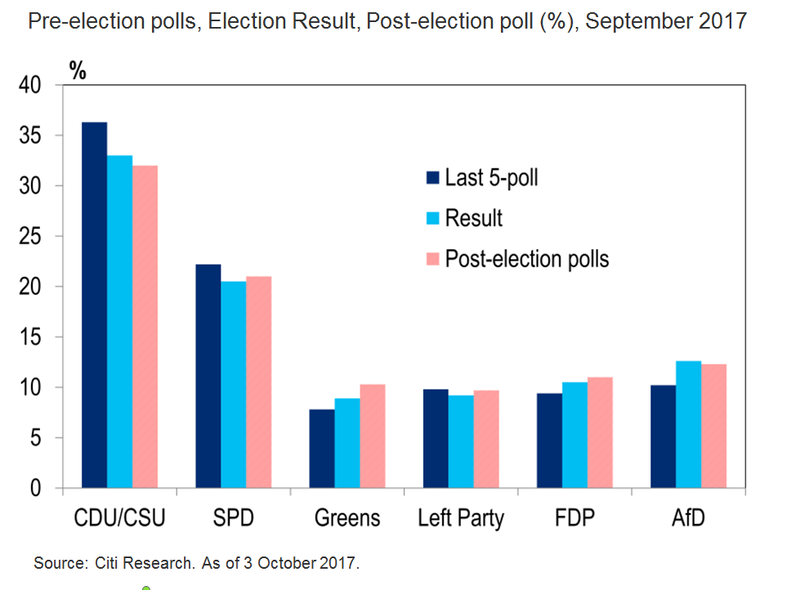 Germany Election Aftermath: What Now? All eyes are now on the German coalition negotiations. The elections on 24 September saw Angela Merkel set for a fourth term as German chancellor although there was a sharp fall in support for her Christian Democrat-led alliance. For the first time in German post-war history, a three-party coalition is expected. Citi's base case expects a "Jamaica coalition", a term in German politics that describes an alliance among the parties of the Christian Democratic Union/Christian Social Union (CDU/CSU), Free Democratic Party (FDP), and the Green Party. Tax cuts likely to be delayed: Lengthy coalition talks and the political calendar look set to postpone income tax cuts of €15bn (0.5% of GDP) from 2018 to 2019. Eurozone at risk? The FDP's Eurozone policy proposals could pose a risk to Eurozone financial stability and rekindle Grexit fears. However, Citi analysts doubt that this pro-EU party would put Germany's relations with France and the rest of Europe at risk. Sectors that could potentially benefit/suffer: On the positive side, the FDP's ideas to improve the environment for start-ups, venture capitalists and private equity could benefit these as well as those they typically invest in, such as tech-firms. Fewer restrictions on temporary work could benefit labor-intensive industries such as logistics or hospitality?. Service sector deregulation may benefit retail trade and pharmacies. More investment in education should boost those in the private sector connected to that. On the negative side, some of the Greens policies such as phasing out fossil energy generation by 2030 (which may hurt energy utilities) or phasing out combustion car engines by 2030 (which would hurt car manufacturers) may be adopted as well. Fewer energy tax exceptions for large users could affect energy-intensive industries such as metal producing, while the FDP's Eurozone ideas could endanger financial stability and thus banks.